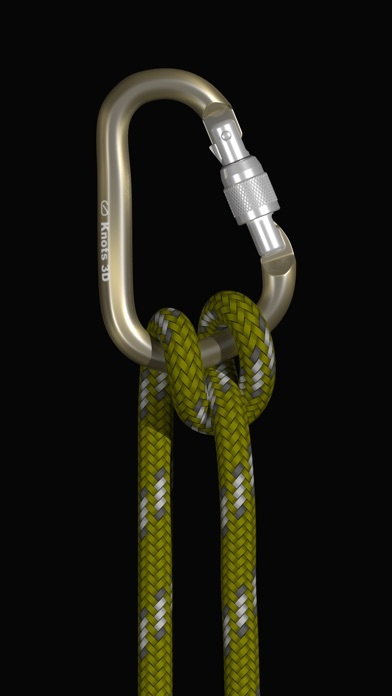 Used by arborists, fishermen, firefighters, climbers, military and boy and girl scouts the world over, Knots 3D will quickly teach you how to tie even the most difficult knot. With more than 130 knots, Knots 3D will be your go-to reference! Grab some rope and have fun! - Included in Scouting Magazine's "The Best Scouting Apps of 2016" and "Ultimate List of Scouting Apps" (2014) - Featured in iOS Today, GQ Magazine, Boating Magazine, Guy Harvey Magazine and many other well known print and online and media. 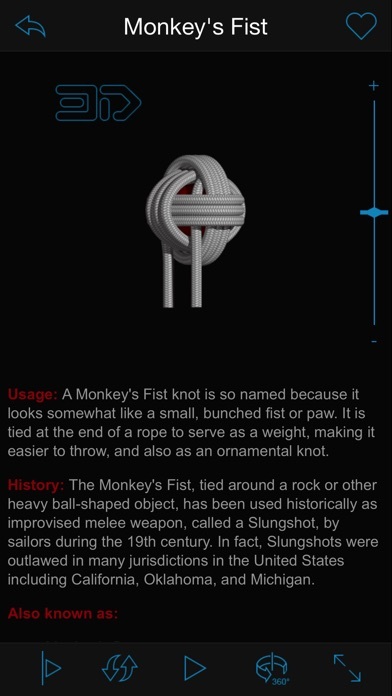 - #1 Reference App in 75 Countries Have you ever wondered what a knot looks like rotated 40° or maybe 90°? Or maybe you want to see what a Bowline knot or Constrictor knot looks like from the back? Use your finger to spin the knot and see how it looks from any angle in 3D! Choose from 131 different knots and see how they're tied in incredible detail. Watch the knot draw itself or use your finger to tie and untie the knot. Its easy to see where the virtual rope goes in and out and around. (Something about a rabbit and a hole and a tree right? ) Zoom in on the knot to get a closer look or flip it around for another perspective. Can your old school knot app do that?! 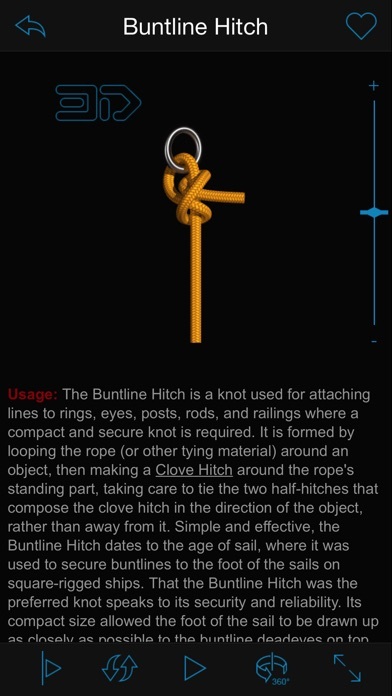 Product Features and Functions - Compatible with iPhone, iPad, and iPod Touch (Universal App) - High res graphics with photo-realistic rope textures - Learn to tie 131 unique knots - Watch knots tie themselves and pause or adjust the speed of the animation at any time - Rotate knots in 360 degree, 3D views to study them from any angle - Zoom in on a knot to see it in greater detail - Interact with the knot on screen via multi-touch gestures such as pinch-to-zoom and swipe to tie/untie. - Browse knots by category or search by name - Completely self contained -- No internet required! - 100% localized for over a dozen languages: English, Chinese, Danish, Dutch, Finnish, French, German, Hebrew, Italian, Japanese, Korean, Norwegian, Polish, Portuguese, Russian, Spanish, Swedish and Turkish! Each 3D knot has detailed reference information including tying pointers, strength and reliability, structural info, and Ashley reference numbers (ABoK) and occasionally the history behind the knot. The knots are arranged by both Category (Boating, Climbing, Fishing, Scouting, etc) and Type (Bend, Loop, Stopper, etc). If you find a knot you like or want to come back to later, add it to your Favorites list for quick reference. 3D KNOTS ------------------ Anchor Hitch, Ashley’s Bend, Blood Knot, Bowline, Bowline on a Bight, Buntline Hitch, Carrick Bend, Cats Paw, Clinch Knot (Improved), Clove Hitch, Constrictor Knot, Larks Head Hitch, Double Sheet Bend, Figure 8 Knot, Figure 8 Bend, Figure 8 Loop, Fisherman’s Eye, Fisherman’s Knot, Jar Sling Knot, Loop Knot, Overhand Knot, Perfection Loop, Rolling Hitch, Round Turn & Two Half Hitches, Running Bowline, Square Knot (Reef Knot), Sheepshank, Sheet Bend, Stevedore’s Knot, Surgeon’s Knot, Surgeon’s Loop, Taut Line Hitch, Timber Hitch, Water Knot, Alpine Butterfly, Trucker's Hitch, Prusik Hitch, Rapala Knot, San Diego Jam, Diagonal Lashing, Double Coin Knot, Mooring Hitch, Round Lashing, Shear Lashing, Square Lashing, Trefoil Knot, Jury Mast Knot, Monkey's Fist, Turk's Head and many more! Complete Knot List at: http://knots3d.com/knots/en_us/ALL KNOTS 3D REVIEWS ---------------------- Superb in every way - 5 Stars! I'm a fairly handy guy (surgeon) and rely on several knots in my practice. Nevertheless I'm pretty hopeless at learning new knots and remembering them, even though I'm a sailor and do some fishing. Knots 3D is the answer. I love every aspect of the app. Great App - 5 Stars! 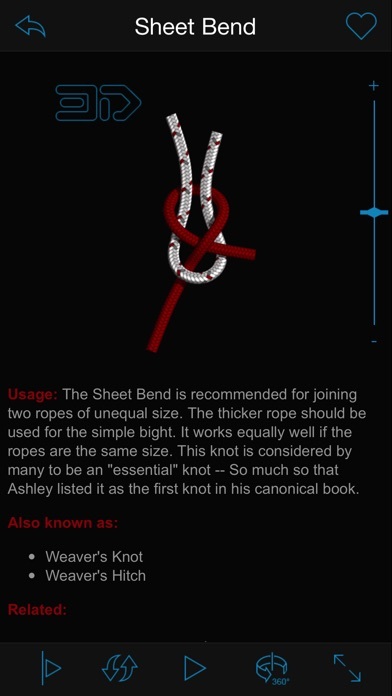 I really like this app, I have four knot apps, and I use this one the most. 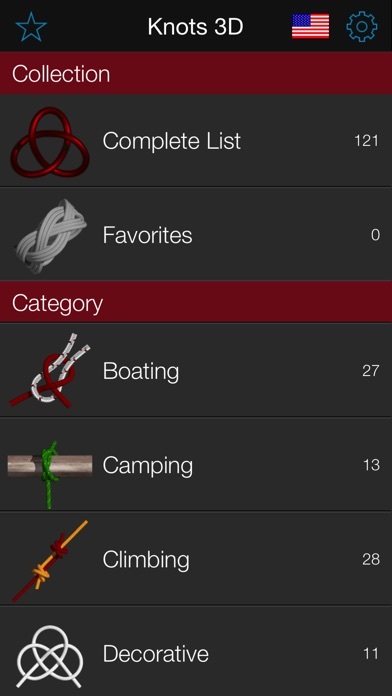 As a firefighter rope skills is a must and this app helps keep me "knot prepared". The zoom and step through the knot using a finger gestures is real handy. The author updates this app with new knots often. I recommend this app.